HOW TO KNOW THE MAXIMUM WEIGHT YOU CAN LOAD INTO A CONTAINER. EVERY SHIPPING CONTAINER HAS ITS MAXIMUM WEIGHTS CLEARLY ADVISED ON THE RIGHT HAND DOOR. 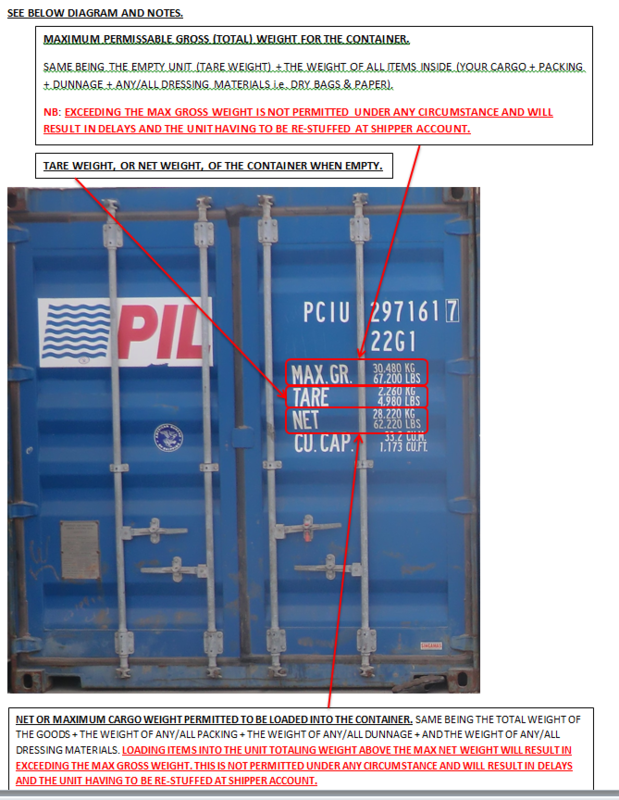 MAX GR IS THE MAXIMUM TOTAL WEIGHT FOR THE STUFFED UNIT/CONTAINER, TARE IS THE EMPTY UNIT/ CONTAINER WEIGHT AND NET IS THE TOTAL WEIGHT OF CARGO ALLOWED TO BE LOADED INTO THE CONTAINER.